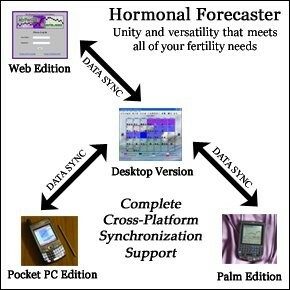 The Hormonal Forecaster is a suite a software products that enables users to understand the natural timing of their body. Key features include fertility charting, an ovulation calendar, and statistical analysis of custom defined symptoms. 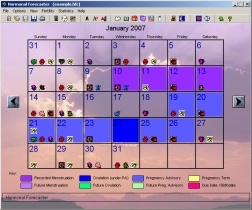 Initially the Hormonal Forecaster was only available for users to download and run on their desktop computers running Microsoft Windows. In the past several years, new releases of the software began targeting Palm OS and Windows Mobile handheld devices such as Palm PDAs, Pocket PCs, and smartphones. The web edition is the most recent release which allows users to manage their fertility completely online in the form of an online charting service. 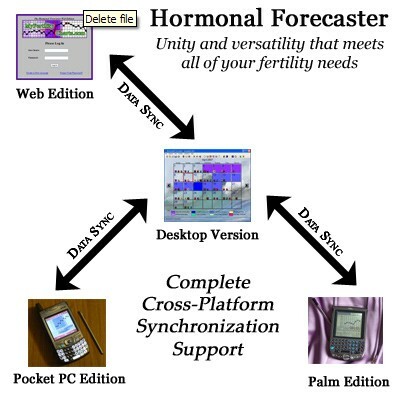 While the different editions of the Hormonal Forecaster can be used in isolation, one of the most powerful features is the fact that you can use multiple editions and synchronize your data records between them. This even applies to the web edition. By downloading the Hormonal Forecaster desktop version, you can transfer records entered online to your desktop for offline analysis. You can also enter records on your computer and then upload them to the web edition later. This enables women trying to achieve pregnancy or just track their cycles to have access to their data on multiple platforms in multiple formats. and synchronize it back to your desktop software. Whether you choose to start using the online Web Edition now, download the Desktop Version, or try another edition of the Hormonal Forecaster first, you can always return to this site to sign up or download other editions later and merge them with your current data. My Fertility Charts (also called the Hormonal Forecaster Web Edition) is a free online charting service that enables women to manage their fertility online by tracking symptoms, charting data, and calculating fertility and ovulation dates. It is based upon the Hormonal Forecaster award winning fertility software. As an online ovulation calendar, My Fertility Charts allows women to analyze and understand their fertility through online charting. Users can record symptothermal symptoms including basal body temperatures, menstruation, cervical mucus observations, cervical position, saliva ferning patterns, and ovulation test results to pinpoint ovulation to help achieve conception. You can generate and view symptothermal BBT charts, ovulation dates, your menstrual cycle calendar, custom event records, and even shared user charts. In making the features available online, the power of the Hormonal Forecaster is now available to anyone anywhere. Copyright © 2001-2010 Clocking Edge, LLC. All Rights Reserved.